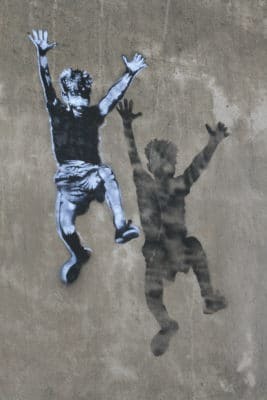 Did you know that boys are wired to move? Their brains, in fact, enter a rest stage when they’re not moving, which is one reason why so many boys (and men) have such a hard time sitting still for long periods of time. Unfortunately, in all together too many classrooms, boys are still expected to sit down and be quiet for most of the day — and that’s one reason why so many boys hate school. If your son doesn’t attend or have access to one of these schools, all is not lost. One of the easiest things you can do to help him succeed in school is give him permission and room to move. OK, I might have lied there a little bit. This might not be easy for you at all. See, our society fetishizes neatness and orderliness. Flip through any women’s or home magazine, and you’ll see article after article about how to decorate and organize your house. You’ll see pictures of cute mudrooms, with nary a trace of mud in sight (never mind the multitude of shoes that seems to populate most real-life mudrooms). You’ll see family rooms with creative storage solutions, with all “stuff” neatly stowed away. Well-groomed, stylishly-dressed children and furry pets populate the scenes, yet there are no smudge marks on the walls, stains on the floor or holes in the furniture. If you’re a mom, you know that women still feel an ordinate amount of pressure to create and maintain immaculate homes. If you’re a dad..yes, it’s true. Women really do feel pressure to maintain picture-perfect homes. Add to that the fact the our society prefers quiet, well-behaved children. Rambunctious children are constantly being told to settle down and be quiet. So the idea — and the reality — of allowing your boys to let loose in the house can be a little unsettling. I get it. I really do. I’d always dreamed of having a cute and cozy house too, and by nature, I’m an introvert who likes quiet, not chaos. But here’s what I’ve learned in 18+ years of parenting boys: BOYS NEED TO MOVE. And when I create conditions that allow them to move, that support their need for movement, they are happier, more content and better able to cope with the demands of school and life. Which is why, over the course of the last 18 years, I’ve gradually adjusted my expectations. You see, I used to have a no balls in the house rule too. I used to ban toy guns. And if you’d told me, even a few months ago, that I’d allow my children to scooter in the house, I would have told you you’re crazy. It’s not picture perfect, but it IS a good place to practice flips. Those sleeping bags off to the side? 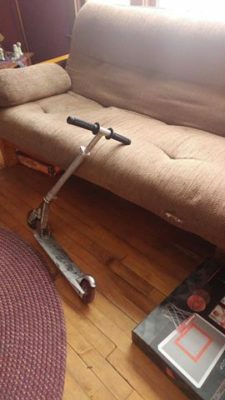 My 13-year old has been using them (and the couch cushions, which are on the floor more than on the couch lately) as padding as he works to perfect a front flip. That funny-looking red thing? It’s an inflatable punching bag thing that my 16-year-old picked up at Goodwill for $2.00. (The night he brought it home, after 20 minutes of playing with it, he said, “I’m pretty sure I’ve gotten at least $2 worth of enjoyment out of this already.”) My 13-year old has been using it for flip practice too. 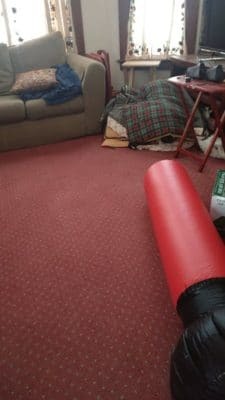 He lays it in the floor, in front of the couch cushions/sleeping bags; it provides an obstacle for him to jump over, to make sure he catches enough air. What you can’t see in these photos my dinging room table pushed to the side of my dining room. Why? For better access to the Nerf basketball hoop, which hangs on the back of the dining room door. And to create a longer “runway” for my 13-year old to use as he practices his flips. …the exercise balls my youngest two boys bought at Walmart with Christmas gift cards. 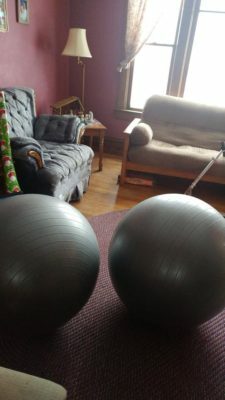 Despite 18+ years of parenting, writing and reading about boys, it never occurred to me that a 13-year old and a 10-year old might spend Christmas money on exercise balls. I’d never considered an exercise ball as a gift for a kid! But boy, have they had fun with these! They sit on them, roll over them, bounce them — you name it, they’re probably done it. When I facilitate and accept their need for movement, I help my boys to understand and accept it as normal, instead of something to suppress. I help them test their physical boundaries and develop their bodies and minds. And most importantly, I give them a space to be themselves. After sitting in school all day — a place that too often subtly shames boys for their interests and ways of perceiving and interacting with the world — it’s a relief, I think, for my boys to be able to be. Please note: giving them space and permission to move does not mean that anything goes. My boys know they can’t break things or hurt others. They know they need to respect others’ needs for space and quiet too, and we’ve all learned when and how to request quiet, and when we can tolerate someone else’s need for music or movement. Since Christmas, the scooter is a permanent fixture in our house, except when he has it outside! It’s a wonderful source of activity for him, and he is very passionate and knowledgeable about them. I allow him to use it, and practice tricks inside. Amazingly, he has never damaged anything! I praised him about that and his response was that he knows it would be the end of scootering in the house if he is careless… I never told him that, but clearly he knows his (and my) boundaries! My advice to you: Make your house a haven for movement. Don’t stress over what the house looks like; prioritize the physical and emotional well-being of the home’s inhabitants instead. How do you encourage/support movement in the house? I’d love to hear your stories in the comments section below!